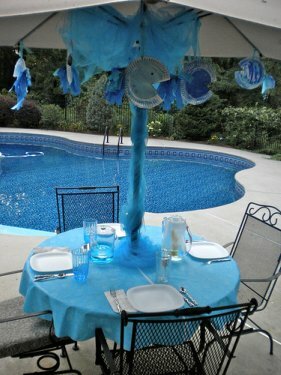 A fish birthday party with a Finding Nemo or under the sea theme, makes for a great pool party. Fish and water just go together like peanut butter and jelly. From inflatables to swim rings and dive hoops who wouldn't want to be at this party? 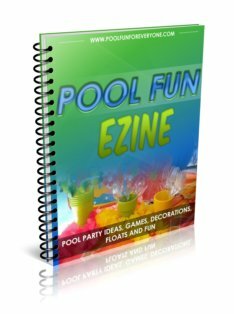 Make your pool party invitations stand out by giving a theme to your party - these cool fish party invites attract a lot more curiosity and build more excitement than a plain pool party invite. 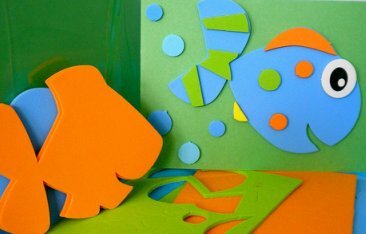 A foam fish craft is glued on stock paper from Target. Matching colored envelopes come with the cards. I type up the party wording on the computer, trim it and then glue it to the other side of the stock card paper like the one pictured. 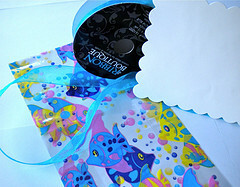 Make your own invites like these to make a "splash" of a first impression that this party is going to be fun! 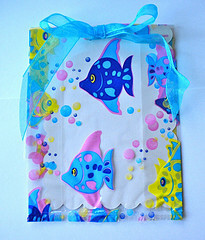 The inexpensive cellophane fish gift bags serve as the "envelopes" to the invites. Print the party details on white cardstock paper and put them in the bags. Fold over the top and punch two holes close together. Tie with blue ribbon. 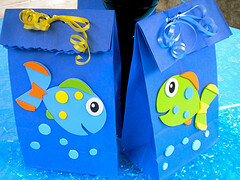 Fish birthday party supplies like these fish party favor bags serve double duty - use them as gift bags for your fish party favors and as your table decorations. Some blue shimmering Easter grass is pooled around the bottom of the umbrella pole. Ideas for party favors include fish straws, squirting toys, and temporary tattoos. 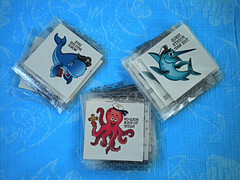 We also use the tattoos as a fun way to engage kids in the party activities while waiting for all the guests to arrive. You simply need a bowl of water, a washcloth and a helper. For a little over $5 you have an activity and plenty extra for take home party favors. 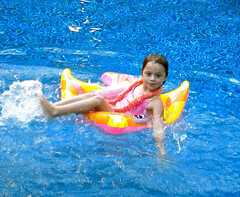 Get two inflatable fish swim rings - one for each team. Each team member sits inside the swim ring and kicks their feet and paddles with their arms to the other side of the pool and back. The next team member hops in the swim ring and takes their turn at the race. The team that finishes first wins. Dive for these colorful, tropical fish for guests who are good swimmers. There doesn't have to be a winner - just let kids take turns seeing how many they can gather in one breath. Before they sink to the bottom the fish have to fill up with water first. Our sidewalk to our pool and pool gate starts at the garden arbor. This is the first place I always decorate for our pool parties. It lets the guests know that this is the way to "party central" and sets the theme for the event. 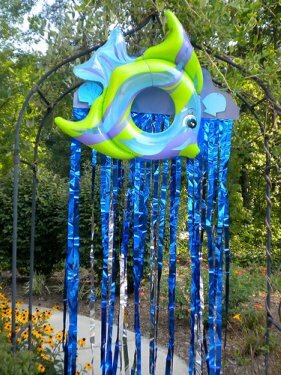 The tropical fish inflatable swim rings were place on the garden arbor and at the pool gate. I always try to have something decorating the sidewalk as well whether it is chalk-drawn lily pads for a frog party, gold coins for a pirate party, or small plastic fish or fish stickers for a fish or under the sea party. Use inflatable swim rings to decorate your themed party. Hang one on the gate to the pool. 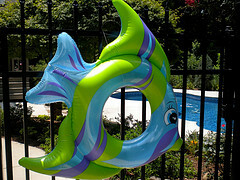 I've found these tropical fish inflatable swim rings that were used for several of our kids pool parties. Tie some fish string around the middle and hang it on the pool gate. 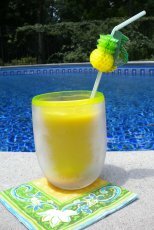 I also found some colorful plastic squeeze fish for playing in the pool that I also used in the table setting. Set some netting up with ropes and string it along your pool fence or if it is an evening party, you can string fish party lights on the deck, the patio umbrella, a garden trellis, or in a bush. 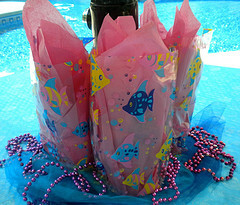 Clear, cellophane fish themed party bags are lined with tissue paper and filled with take home goodies. Set them around the center of the table surrounded by blue netting. Fill the pool with fish themed beach balls. Use them for games, free play and as take home party favors. 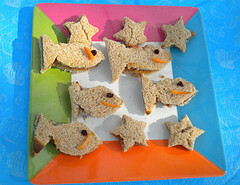 Serve peanut butter and jelly sandwiches cut from a fish cookie cutter. Use raisins for the eyes and small strips of carrot for the mouth. Kids will eat them up. Use the cookie cutter for jello or cookies as well. Fun cupcakes are our favorite pool party food. 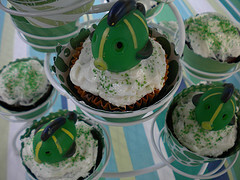 Top the frosted cupcakes with tropical fish that can also be played with in the pool. Not only are cupcakes easy to make, they are easy to serve. I use canned frosting as it holds up better in the heat and doesn't melt like frosting made with butter. No need for plates or forks, which makes clean up easy too! Decorating with these squeezable colorful fish made the perfect cake decorations. These fun fish were used as cake toppers and party favors for our Under the Sea Party cake. Sprinkle colored sugar, sprinkles or coconut on top of the frosting. 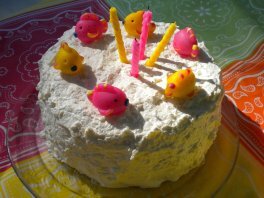 Have some fun in the sun at your next pool party and make some fish birthday party memories.